A long stretch of dry and gradually warming weather will start on Wednesday. High pressure is moving into the area and will remain parked over the region for much of the next 5 to 7 days. During this time frame, precipitation is very unlikely and temperatures will transition from below normal to above normal. Clear skies overnight let temperatures drop back into the 20s for the start of Wednesday. With high pressure moving overhead from the west, the flow of air over the Finger Lakes will be from the north. Without a source of warm air, temperatures will remain chilly for Wednesday, with highs in the mid 40s. 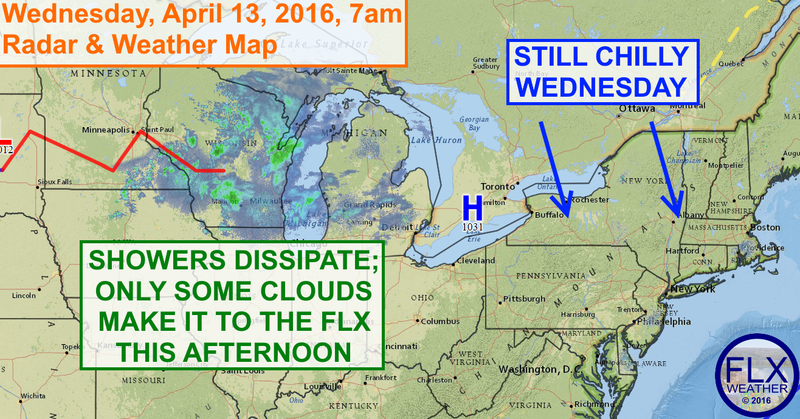 Sunny skies this morning will give way to some afternoon cloudiness as a weakening disturbance approaches. The precipitation associated with this system over the Upper Great Lakes this morning should dissipate and no rain is expected in the Finger Lakes. Skies will quickly clear this evening, resulting in another night in the 20s for most areas. High pressure will shift east, placing us in the southerly return flow on the backside of the high on Thursday. This will trigger a warming trend. Temperatures Thursday will be in the low 50s, but highs will be near 60 degrees on Friday, into the mid 60s on Saturday, and flirting with 70 degrees by Sunday. Skies will generally remain sunny all four days. There will be a chance for a few showers early next week, along with more normal temperatures, but exactly how that evolves is still a bit unclear.